The lesson we must learn from Ori Ansbacher’s brutal murder. 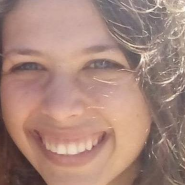 This past Thursday, a 19-year-old national-service girl named Ori Ansbacher was praying in a Jerusalem forest when a Palestinian came, brutally assaulted and murdered her. “It’s important for us that the world know who Ori was. Ori was a child of light. She cured broken hearts wherever she went. “Ori was a child of land and words. She so loved this Land, she would wander around it so much. She would set out to walk, to breathe, to sit, to work in this land. “Sometimes when I spoke with her I felt that it was not a conversation between a mother and a daughter, but rather that she was my teacher. A noble soul, so gentle. And within that gentleness hid tremendous strength. “She was a girl of inner truth. She was always looking for ways to fix the world, through goodness–through giving, through love. In the aftermath of this inhuman act of pure evil, there is a strong message I am hearing. When this terrorist set out from Hevron with a knife, he was looking for a Jew to murder. He didn’t care if that Jew was secular, religious, right-wing, left-wing, Ashkenazi, Sephardi, rich or poor. And this is something, and it pains me to say this, that we need to learn from this monster. All he cared about was that Ori was a Jew, and he wanted to spill Jewish blood, to kill a Jew, any Jew. We Jews, on the other hand, have a tendency to focus on the nuances that divide us. On the fact that another Jew isn’t like you because she votes for a different political party, or prays in a different synagogue, or doesn’t pray in a synagogue at all. And the only time we come together, when we stop noticing the nuances that divide us, is when tragedy strikes. When there’s, G-d forbid, a war, a terror attack, a kidnapping, an accident. Then we remember how close we really are to every single Jew. That a Jewish soul is a Jewish soul is a Jewish soul, no matter what color kippah he wears or doesn’t wear. On Tuesday, February 26th, thousands of Jewish women across the world are gathering together to sing and pray and to declare a Jew is a Jew is a Jew. And that we don’t need any more tragedies to understand that we, the Jewish people, are one. That Ori didn’t die in vain.